In today’s upscale homes an home theater is becoming more and more common all the time. Why go out when you can have all the benefits of the big screen in the comfort of your home! Of course lighting a home theater must be executed correctly to fully enjoy the viewing experience. Front view of a beautiful home theater. In the photo to the left you will see an example of an amazing home theater. Notice all the layers of light. That is what differentiates an ordinary room from a spectacular room (not just a home theater room, but any room). The lighting in this room combines LED and halogen. (The room was build several years ago before reliable LED tape light products were available). Another crucial element in home theater lighting is the lighting control package. You want to be able to dim the lights and control all the circuits from the comfort of you seat. This sophistication is expensive and requires an experienced lighting controls expert to execute, but it makes all the difference in the world. Rear view of the home theater. I am proud to say that the lighting in this room was provided by Fogg Lighting Please visit us at FoggLighting.com and call and email with any questions or requests. And remember when you build your next house include a home theater. It doesn’t need to be this elegant, but it will still be fun. Remember….layers of light!! Wired! 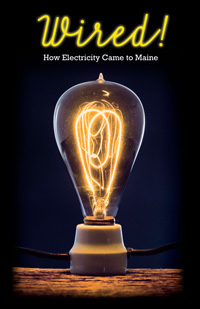 explores the electrification of Maine during the 20th century, and how a rural state became modern. Told primarily through material from the Central Maine Power collection, it explores the landscape, mechanics, economics, politics, and culture of electricity. The story begins with efforts to harness the energy of Maine’s rivers to power small mills. It spreads as entrepreneurs, tinkerers, and investors sought to transmit that energy further and further, and to sell it to businesses and homeowners. Finally, the story is about the grid, and what it took to get it built. The exhibit explores how Mainers were shaped by power: engineers and linemen who figured out how to deliver electricity to the masses, and people everywhere who overcame initial fears to embrace and rely on it for almost every aspect of their daily lives. As we continue to look for affordable, clean energy, this is a story that joins Maine’s past, present, and future. Please take time to visit this fascinating exhibit at The Maine Historical Society, 489 Congress Street, Portland, ME. You can check their website, http://www.mainehistory.org/, for hours. And please visit www.FoggLighting.com for all your lighting needs. Vision provides us with most of the information that we rely on to survive, and vision would not be possible without light. Light is the stimulus for vision. The receptors in the eye only respond to electromagnetic energy between 380 nanometers (nm) and 760 nanometers (nm). 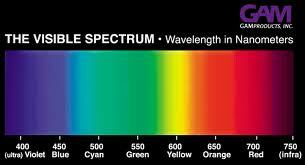 The difference between x-rays, radio waves, UV, IR and visible light is their wavelength. When light travels through a prism the speed at which it travels slows down and the light waves are bent and refracted at different angles so the light emerges as a fan of different colors. What we see as colors are the colors in the light. A blue wall is blue because the light source contains wave lengths in the blue part of the spectrum. Since light is such an important factor in all our lives it is essential that the environments that are created by lighting designers must allow the eyes to function at optimum levels for the psychological and general well being of the inhabitants. That is the reason you must take control of your lighting. Learn as much as you can about proper lighting so that you will be able to direct the installation of that lighting. But if you do not want to take the time to do that, hire a trained lighting professional to represent your interests. Get the lighting you want and need. The difference between good and bad lighting is huge and will impact your life for years. Budgets are tight, but do not skimp on the lighting…it is what enables you to enjoy everything else in your house. Please visit FoggLighting.com and like us on Facebook.